During the development of type I diabetes mellitus in nonobese diabetic (NOD) mice, T cell autoimmunity gradually spreads among β cell Ags. Little is known about how autoantigen-based immunotherapies affect this spreading hierarchy. We treated newborn NOD mice with different autoantigenic β cell peptides (in adjuvant) and characterized their T cell responses at 4 wk of age, when autoimmunity is usually just beginning to arise to a few β cell Ag determinants. Surprisingly, we found that regardless of whether an early, or late target determinant was administered, autoimmunity had already arisen to all tested β cell autoantigen determinants, far in advance of when autoimmunity would have naturally arisen to these determinants. Thus, rather than limiting the loss of self-tolerance, immunotherapy caused the natural spreading hierarchy to be bypassed and autoreactivities to develop precociously. Evidently, young NOD mice have a broad array of β cell-reactive T cells whose activation/expansion can occur rapidly after treatment with a single β cell autoantigen. Notably, the precocious autoreactivities were Th2 type, with the exception that a burst of precocious Th1 responses was also induced to the injected autoantigen and there were always some Th1 responses to glutamic acid decarboxylase. Similarly treated type 1 diabetes mellitus-resistant mouse strains developed Th2 responses only to the injected Ag. Thus, autoantigen administration can induce a cascade of autoimmune responses in healthy (preautoimmune) mice that are merely genetically susceptible to spontaneous autoimmune disease. Such phenomena have not been observed in experimental autoimmune disease models and may have important clinical implications. Studies of animal models of organ-specific autoimmune diseases suggest that a cascade of autoreactive Th1-type proinflammatory responses mediates the disease process (1, 2, 3, 4, 5). Although the initial autoimmune response is limited in its recognition of self-Ags, it subsequently expands to involve other Ags within the target tissue (2, 5, 6, 7, 8, 9, 10, 11, 12, 13). This spreading of T cell autoimmunity often follows a defined chronological pattern during disease progression. For example, T cell autoimmunity primed by a single encephalitogenic peptide of proteolipid protein spreads intramolecularly (within proteolipid protein) and intermolecularly (to other myelin Ags) in a defined order (6, 7, 10, 11). Such sequential spreading of T cell autoreactivity has also been observed in patients with multiple sclerosis during disease progression (11, 12). Studies in the nonobese diabetic (NOD)3 mouse model of type 1 diabetes mellitus (T1DM) suggest that the spreading hierarchy results from the activation and expansion of high-avidity β cell-reactive T cells, followed by T cells with progressively lower avidity, as a growing islet perturbation increasingly provides immunostimulatory signals (14). To inhibit this autoimmune cascade, a great deal of research has focused on administering the target autoantigens (or altered peptides thereof) in modalities that are designed to induce regulatory responses (such as Th2, Th3, Tr1, or other anti-inflammatory cells) (4, 15, 16, 17, 18, 19, 20, 21, 22, 23, 24, 25, 26). The induced regulatory responses can selectively down-regulate effector cells in the target tissue, apparently with minimal interference in other immune system functions. Based on the success of this approach in inhibiting disease progression in animal models of organ-specific autoimmune diseases, a number of Ag-based immunotherapies have moved into clinical trials. Importantly, the administration of a heat shock protein (HSP) peptide in adjuvant was recently found to preserve β cell function in new-onset T1DM patients, presumably through an immunomodulatory mechanism (27), and other clinical trials are currently underway which deliver insulin or glutamic acid decarboxylase (GAD) in modalities designed to induce regulatory responses. We and others working with the NOD mouse model have observed that immunotherapies that administer a β cell autoantigen in a Th2-inducing modality lead to the spreading of Th2-type autoimmunity to other β cell Ags (5, 28, 29, 30). Many fundamental questions remain concerning this Th2 spreading process. For example, does the induced Th2-type autoimmunity spread to downstream determinants in the same chronological pattern as that of spontaneous Th1 autoreactivity? Or, is the chronology in which autoreactivity (Th2 or Th1 type) spreads to new β cell autoantigen determinants slowed or even halted since Th2 cytokines are anti-inflammatory (e.g., IL-10 down-regulates MHC expression and Ag presentation) and inhibit disease progression (31, 32)? Or, do the induced Th2 responses spread in different patterns depending on whether an early or late target tissue autoantigen was used for immunotherapy? To gain a better understanding of the immunological impact of Ag-based immunotherapies, we studied the dynamics of the Th2 responses induced by different β cell autoantigenic peptides. The β cell autoantigenic peptides we tested contained an early or late target determinant that was previously shown to inhibit T1DM in NOD mice when administered in adjuvant (Refs. 29, 33, 34 and our unpublished observations). We found that neonatal administration of any β cell autoantigen, containing an early or a late target determinant, caused the natural autoimmune spreading hierarchy to be bypassed and T cell autoreactivity to arise precociously to all of the tested β cell autoantigen determinants by 4 wk of age. These precocious autoreactivities were Th2 type. Additionally, a burst of precocious Th1-type autoimmunity arose to the injected autoantigen itself (leading to a mixed Th1/Th2 response). Although neonatal autoantigen treatment induced precocious Th2-polarized responses to all downstream target determinants (except for the injected Ag), there was always a mixed Th1/Th2 response to an early target determinant of GAD. We discuss the insights these findings provide into the protective mechanism of Ag-based immunotherapy, as well as the spontaneous autoimmune process in NOD mice. NOD mice (Taconic Farms, Germantown, NY) were bred under specific pathogen-free conditions. In our colony, ≈85% female NOD mice spontaneously developed T1DM by 30 wk of age. Only female mice were used in these studies. The care and use of all mice in this study was approved by the University of California, Los Angeles Animal Research Committee. The 65-kDa form of mouse GAD and control Escherichia coli β-galactosidase were purified as previously described (2). The autoantigenic and immunodominant GAD peptides that were tested included GAD(524–543) (also termed GADp35; SRLSKVAPVIKARMMEYGTT), GAD(78–97) (also termed GADp6; KPCSCSKVDVNYAFLHATDL), and GAD(217–236) (also termed GADp15; EYVTLKKMREIIGWPGGSGD) (2, 5, 29, 35). Peptides from other key β cell autoantigens included the immunodominant peptide of the 65-kDa HSP, termed HSPp277 (VLGGGCALLRCIPALDSLTPANED) (33) and insulin β-chain (Sigma-Aldrich, St. Louis, MO). Control peptides included GAD(157–176) (EEILMHCQTTLKYAIKTGHP, also known as GADp11), which does not contain a determinant, and an immunogenic hen egg lysozyme (HEL) peptide (11 25) (AMKRHGLDNYRGYSL) (36). With the exception of the insulin β-chain, all peptides were synthesized by Multiple Peptide Systems (San Diego, CA) and were ≥95% purity. Female NOD mice were injected on the day of birth and 2 days later with 200 μg of a control Ag or a β cell Ag i.p. in 50% IFA (Life Technologies, Rockville, MD). At 28 days of age, their splenic T cells were isolated and analyzed for responses to a panel of control and β cell Ags by ELISPOT. Splenic T cells were isolated at 28 days of age from individual neonatally treated mice and unmanipulated mice, and the frequency of Ag-specific T cells secreting IFN-γ, IL-4, and IL-5 was determined using a modified ELISPOT technique (28, 37). Briefly, 106 splenic mononuclear cells were added per well (in triplicate) of an ELISPOT plate (Millipore, Bedford, MA) that had been coated with cytokine capture Abs and incubated with peptide (20 μM) or whole protein (100 μg) for 24 h for IFN-γ or for 40 h for IL-4 and IL-5 detection. After washing, biotinylated detection Abs were added and the plates were incubated at 4°C overnight. Bound secondary Abs were visualized using HRP-streptavidin (DAKO, Carpinteria, CA) and 3-amino-9-ethylcarbazole. Abs R4-6A2/XMG 1.2-biotin, 11B11/BVD6–24G2-biotin, and TRFK5/TRFK4-biotin (BD PharMingen, San Diego, CA) were used for capture and detection of IFN-γ, IL-4, and IL-5, respectively. Experimental and control mice were tested simultaneously (in triplicate) in two separate experiments (n = 5 for each group). The administration of Ags in IFA has been shown to prime Th2-biased responses and is a classic mode of inducing tolerance (37, 38). Some of the most studied β cell Ags that can effectively inhibit the long-term development of T1DM in NOD mice (when administered in IFA) include; insulin β-chain (34, 39), HSPp277 (33), whole GAD (40), GAD(217–236) (29), GAD(524–543) (29), and GAD(78–97) (our unpublished observations). We treated female NOD mice neonatally with one of these β cell autoantigens, or a control Ag, in IFA and tested their responses to the panel of Ags at 28 days of age, a time at which spontaneous autoimmunity is just beginning to become detectable to a limited number of β cell Ags in unmanipulated NOD mice (2, 8, 14, 41). By treating the mice and testing their autoimmune responses at an early age, we avoided confounding the results with the many spontaneous autoimmune responses that naturally arise at later stages of the disease process, thereby allowing us to readily discern any neoautoimmunity induced by the immunotherapy. At 4 wk of age, unmanipulated NOD mice, as well as control NOD mice that were neonatally treated with GAD(157–176) (which does not contain a determinant), HEL (11–25), or β-galactosidase in IFA displayed Th1-biased responses only to whole GAD and GAD(524–543) (Figs. 1⇓, A–C, and 2, A and B). None of these NOD mice responded yet to HSPp277, insulin β-chain, GAD(78–97), or GAD(217–236), which become targets of the spontaneous autoimmune response several weeks later in unmanipulated NOD mice (2, 14). As expected, the control NOD mice that were neonatally treated with HEL (11 25) or β-galactosidase developed strong Th2-biased responses to the injected Ag (i.e., frequent IL-4 and IL-5, but no IFN-γ, secreting spot forming colonies; Figs. 1⇓Cand 2B). They did not display Th2-type responses to any of the β cell autoantigens, indicating that the induced Th2 responses to non-target tissue Ags did not spread to β cell Ags. The frequency of their Th1 responses to GAD and GAD(524–543) were indistinguishable from those of unmanipulated NOD mice. Thus, the priming of Th2 immunity to control nontarget Ags did not appear to affect the quality, quantity, or temporal development of the early spontaneous autoimmune response. Autoantigen administration accelerates the intramolecular spreading of autoimmunity. Newborn NOD mice were injected i.p. with the indicated Ag in IFA (as described in Materials and Methods). At 4 wk of age, the frequency of Ag-specific T cells secreting IFN-γ (▪), IL-4 (□), and IL-5 (▨) in individual spleens was determined by ELISPOT. The data are represented as the mean number of IFN-γ, IL-4, or IL-5 secreting SFC/106 splenic T cells ± SD in response to GAD(524–543), GAD(78–97), and GAD(217–236) in mice that were unmanipulated (A), neonatally treated with control Ag GAD(157–176) (B) or HEL(11–25) (C), or autoantigenic peptides GAD(524–543) (D), GAD(78–97) (E), or GAD(217–236) (F). The background level was ≤5 SFC. The individual variation within each group was <15%. Experimental and control mice were tested simultaneously (in triplicate) in two separate experiments (n = 5 for each group). Precocious autoimmune responses were also observed when NOD mice were immunized with 50–100 μg autoantigens (data not shown). A very different pattern of autoimmune responses was observed in NOD mice that were neonatally treated with a β cell autoantigen. NOD mice that were treated with GAD(524–543) and tested at 4 wk of age displayed responses not only to GAD(524–543), but also to downstream determinants GAD(78–97) and GAD(217–236), which in unmanipulated and control Ag-treated NOD mice do not become targets of spontaneous autoimmune responses until the mice reach ∼6 and 12 wk of age, respectively (2, 14, 28) (Fig. 1⇑D). Notably, the autoreactive responses which arose in a precocious manner to GAD(78–97) and GAD(217–236) were Th2 polarized (Fig. 1⇑D). Similarly, NOD mice that were neonatally treated with GAD(78–97) displayed precocious autoimmune responses to GAD(217–236), which were Th2 polarized (Fig. 1⇑E) and vice versa (Fig. 1⇑F). Thus, following the early administration of a single GAD determinant, the hierarchy in which autoreactivity gradually spreads intramolecularly in control NOD mice was bypassed, and precocious Th2-type autoreactivity appeared to all tested antigenic GAD determinants. This precocious autoimmunity is not the “autoproliferation” described by Fathman and colleagues (42), as we did not observe that mononuclear cells from autoantigen-immunized mice proliferated in the absence of Ag. Neonatal Ag-based immunotherapy also caused autoimmunity to arise precociously to other β cell Ags. Following neonatal treatment with GAD, NOD mice displayed clear T cell responses to HSPp277 and insulin β-chain at 4 wk of age (Fig. 2C⇓), responses which usually do not become detectable in unmanipulated NOD mice until the mice reach ∼6 and 10 wk of age, respectively (2, 14, 28). Again, the precocious responses against HSPp277 and insulin β-chain were Th2 biased. Similarly, neonatal administration of HSPp277 resulted in the development of Th2-biased responses to insulin β-chain by 4 wk of age (Fig. 2⇓D) and vice versa (Fig. 2⇓E). Autoantigen administration accelerates the intermolecular spreading of autoimmunity. Newborn NOD mice were injected i.p. with the indicated Ag in IFA. At 4 wk of age, the frequency of Ag-specific T cells secreting IFN-γ (▪), IL-4 (□), and IL-5 (▨) in individual spleens was determined by ELISPOT. The data are represented as the mean number of IFN-γ, IL4, or IL-5-secreting SFC/106 splenic T cells ± SD in response to GAD, HSPp277, and insulin β-chain in mice that were unmanipulated (A), neonatally treated with β-galactosidase (B), whole GAD (C), HSPp277 (D), or insulin β-chain (E). The background level was ≤5 SFC. The individual variation within each group was <15%. Experimental and control mice were tested simultaneously (in triplicate) in two separate experiments (n = 5 for each group). Thus, contrary to expectations that Ag-based immunotherapy would curtail the development of autoimmunity, we found that the early administration of any β cell autoantigen (containing an early or late target determinant) caused the precocious appearance of autoimmunity to a broad array of β cell autoantigens. Apparently, these treatments create an immunostimulatory environment that drives β cell autoantigen-reactive T cells to activate and/or expand to detectable levels by 4 wk of age. These precocious autoreactivities were highly Th2 biased, with the exception of the responses to the injected autoantigen itself (and the early spontaneous Th1 response to GAD(524–543), see later in the text). Surprisingly, we found that although autoantigen treatment primarily primed Th2 immunity, it also induced the precocious appearance of some proinflammatory Th1 autoimmunity to the injected β cell Ag. For example, NOD mice treated with HSPp277 developed mixed Th1/Th2 responses to this Ag by 4 wk of age (Fig. 2⇑D). In contrast, unmanipulated NOD mice, as well as NOD mice that were neonatally treated with GAD or insulin β-chain, did not yet display Th1-type autoreactivity to HSPp277 (Fig. 2⇑, A, C, and E). Similarly, although none of the other control or β cell autoantigen-treated NOD mice displayed Th1-type reactivity to insulin β-chain at 4 wk of age (Fig. 2⇑, A–D), those that had been treated with insulin β-chain developed some Th1 responses against it (Fig. 2⇑E). 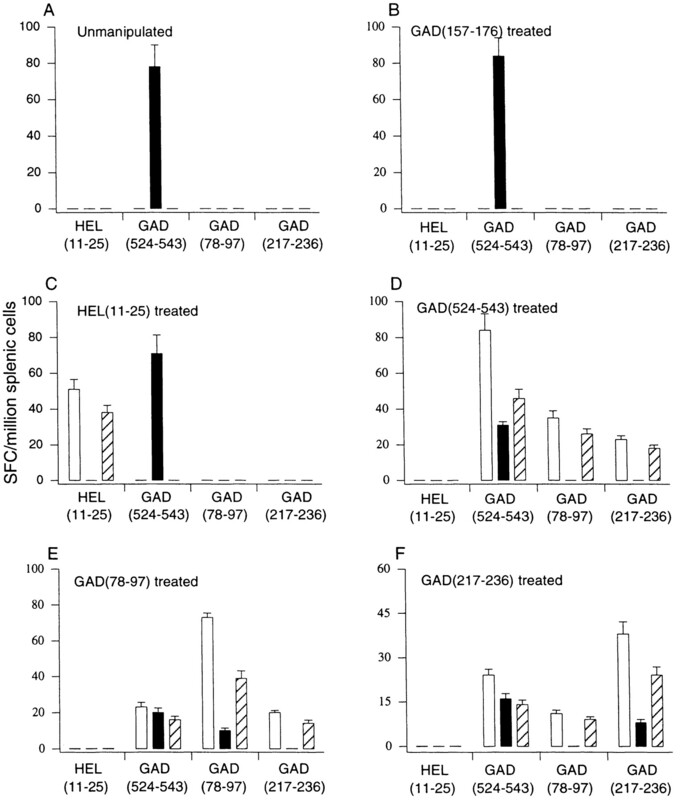 As a final example, although control as well as GAD(157–176)-, GAD(524–543)-, and GAD(217–236)-treated mice did not display Th1 responses against GAD(78–97) (Fig. 1⇑, A, B–D, and F), those treated with GAD(78–97) did (Fig. 1⇑E). Thus, the early administration of an autoantigen, even in a strong Th2-promoting adjuvant, can drive the precocious appearance of some proinflammatory Th1 responses to the injected autoantigen. The burst of precocious Th1-type autoimmunity comprised a significant proportion of the mixed (Th1 and Th2) response to the injected autoantigen in young NOD mice. In the long term, these autoantigen treatments have been shown to greatly reduce Th1-type autoreactivity to the injected autoantigen and other β cell Ags (when the mice are tested at later stages of the disease process (29, 30, 34, 40)). However, our studies reveal that the initial response to early autoantigen treatment can actually include a burst of Th1-type immunity to the injected Ag. This precocious development of a mixed Th1/Th2 response to the injected autoantigen was unexpected since NOD mice develop Th2-polarized responses to non-target tissue Ags administered in IFA (e.g., Figs. 1⇑C and 2B). Moreover, treatment with myelin Ags in IFA induces only Th2 responses in wild-type mice that are susceptible to experimental allergic encephalomyelitis (37, 43). To test whether β cell autoantigens have an inherent propensity to prime Th1-type immunity, we immunized BALB/c and AKR mice with GAD, insulin, and other immunogenic Ags in IFA. We found that these T1DM-resistant mouse strains developed only Th2 responses to the injected autoantigen (Fig. 3⇓). There was no spreading of autoimmunity to any other tested β cell Ags (Fig. 3⇓). Treatment with β cell autoantigens in IFA induces Th2-polarized responses only to the injected Ag in wild-type mice. Newborn BALB/c mice were immunized with β-galactosidase (A), whole GAD (B), insulin β-chain (C), or GAD(524–543) in IFA. At 4 wk of age, their splenic T cells were tested for IL-4, IL-5, and IFN-γ responses to a panel of Ags. The data shown are the mean number of IL-4 (□) and IFN-γ (▪) secreting SFC per 106 BALB/c splenic T cells ± SD in response to the Ag indicated on the x-axis. IL-5 responses were similar to those shown for IL-4 (data not shown). 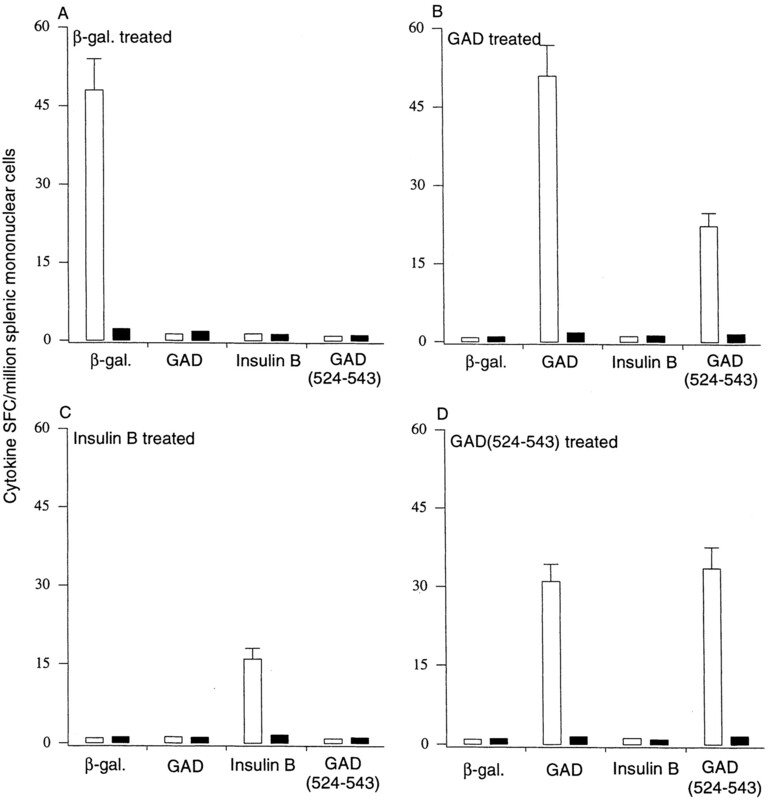 Similar results were obtained using AKR mice that were immunized with β-galactosidase, GAD, or insulin (data not shown). Although neonatal treatment with different β cell autoantigens could promote the precocious development of Th2-polarized responses to GAD(78–97), GAD(217–236), HSPp277, and insulin β-chain in 4-wk-old mice, none of these treatments led to the development of Th2-polarized autoimmunity to GAD(524–543). For example, although neonatally GAD(78–97)-treated animals developed precocious Th2-biased responses to GAD(217–236), they developed mixed Th1/Th2 responses to GAD(524–543) (Fig. 1⇑D). 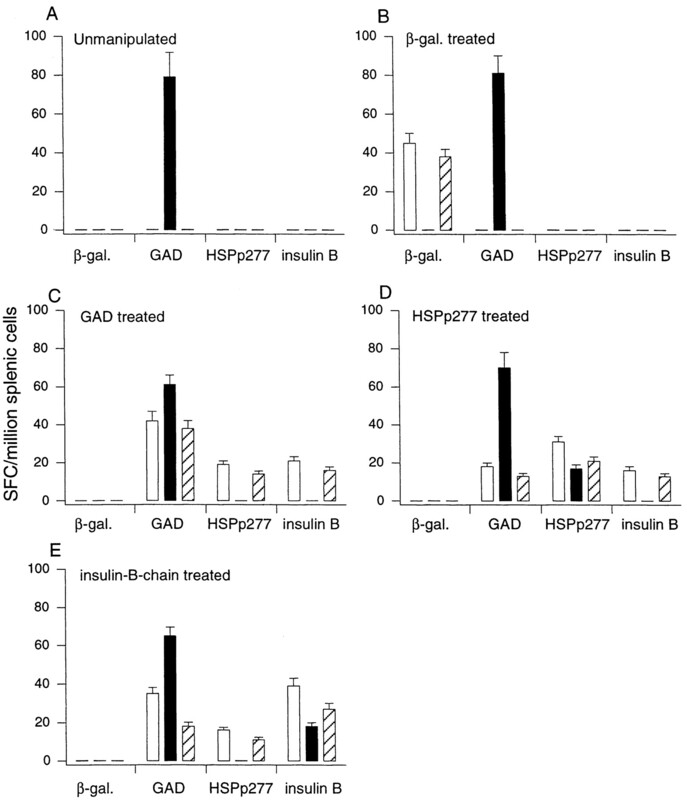 Similarly, although HSPp277-treated animals developed accelerated Th2-biased responses to insulin β-chain and vice versa, neither treatment prevented the development of Th1 autoimmunity to GAD (Fig. 2⇑, D and E). Accordingly, a mixed Th1/Th2 response was always present against GAD(524–543) and GAD at 4 wk of age. However, the frequency of Th1 responses to GAD and GAD(524–543) was significantly reduced in all neonatally β cell Ag-treated mice compared with those of control Ag-treated or unmanipulated NOD mice. The ability of neonatal immunotherapy to promote Th2-biased immunity to all of the tested β cell autoantigens, except for GAD and GAD(524–543), suggests that some GAD-reactive T cells are committed toward a proinflammatory phenotype very early in the disease process. The preautoimmune T cell repertoire of young NOD mice contains β cell-reactive T cells with a wide range of different avidities (14). For the first few weeks of life, these T cells do not appear to interact with self-Ags at sufficient levels to escape activation-induced cell death or to activate/expand to detectable levels. However, as a perturbation develops in the islets of young NOD mice, high-avidity autoreactive T cells (which require less Ag presentation and costimulation to activate/expand (44, 45, 46, 47, 48)) become detectable to a limited number of β cell Ags at ∼4 wk of age (14, 46, 47). This early wave of autoreactive T cells generates additional immunostimulatory signals so that β cell-reactive T cells with lower avidity can become fully activated and expand. Consequently, a proinflammatory positive feedback loop develops which recruits T cells with progressively lower avidity for β cell Ags into the autoimmune response, leading to the observed gradual spreading of T cell autoimmunity among β cell Ags. Surprisingly, we found that this natural spreading hierarchy was completely bypassed following neonatal administration of an autoantigenic peptide in adjuvant. Regardless of whether an early or late β cell target determinant was administered, autoreactivity appeared to all of the tested β cell autoantigens by 4 wk of age. Usually, in unmanipulated NOD mice, splenic T cell reactivity is just beginning to arise to whole GAD and GAD(–543) at 4 wk of age, and autoreactivity to downstream determinants such as HSPp277, GAD(78–97), GAD(217–236), and insulin β-chain does not become detectable until the mice are several weeks older. Thus, rather than inducing nonresponsiveness, Ag-based therapies caused widespread precocious autoimmunity (Th2 type) to β cell Ags. Evidently, very young NOD mice have a broad array of β cell-reactive T cells that can become fully activated and/or expand when sufficient immunostimulatory signals are provided. Their activation/expansion may occur gradually in a defined chronological pattern, as in the natural disease process, or rapidly, as shown here after treatment with a single β cell autoantigen in adjuvant. Precocious Th2-polarized responses arose to all tested downstream β cell Ags in 4-wk-old autoantigen-treated NOD mice, with two exceptions. First, in addition to Th2 immunity, there was always some Th1 immunity to the early target Ags GAD and GAD(524–543). Since (Th1-polarized) autoimmunity naturally arises to these Ags in unmanipulated NOD mice at this age, these responses are not considered precocious. Second, a mixed Th1/Th2 response was always observed to the injected autoantigen itself. Thus, although in the long-term these autoantigen treatments reduce Th1-type autoimmunity to target tissue Ags, they can initially provoke a burst of Th1 autoreactivity to the injected autoantigen. It is notable that although T1DM-resistant mouse strains respond to β cell Ag administration by developing responses only to that Ag, newborn NOD mice, which do not yet have detectable T cell autoreactivity or insulitis, respond by developing widespread T cell autoreactivity to β cell Ags. Such rapid development of broad autoimmunity to target tissue Ags following immunization has not been observed in experimental models of autoimmunity such as experimental autoimmune encephalomyelitis and may be unique to animals that are susceptible to spontaneous autoimmune disease. NOD mice are known to have a deficit in negative T cell selection (49, 50). It is possible that the immunostimulatory environment created by autoantigen (but not control non-target tissue Ag) treatment superceded the activation threshold of many naive β cell-reactive T cells in the repertoire, leading to the observed broad precocious autoreactivity. Conceivably, adjuvant activated APCs guided naive T cells that recognize noninjected β cell Ags toward the Th2 phenotype. In addition, the increased presentation of the injected autoantigen caused some low-frequency partially or fully activated cognate Th1 cells (that would normally undergo activation-induced cell death in very young NOD mice) to activate and expand. Hence, we observed Th2-biased responses to noninjected β cell Ags and a mixed Th2/Th1 response to the injected Ag. The presence of partially activated or low-frequency fully activated β cell-reactive T cells in very young NOD mice would also explain why it is possible to clone T cells with various β cell Ag specificities from 2- to 4-wk-old NOD mice (32, 51). Interestingly, the neonatal autoantigen treatments were able to promote the precocious appearance of highly Th2-biased responses to all tested β cell autoantigens except for GAD and GAD(524–543). The inability of neonatal immunotherapy to avert the rapid development of Th1-type autoimmunity to GAD and GAD(524–543) suggests that these reactivities are committed toward the Th1 phenotype very early in the disease process. We have shown that very large precursor pools of high-avidity GAD- and GAD(524–543)-reactive T cells are present in preautoimmune NOD mice (14) and spontaneous responses arise very early to these Ags (2, 8, 14). Apparently, some of these T cells are driven so early toward the Th1 phenotype that these proinflammatory responses cannot be prevented by neonatal immunotherapy. Indeed, even the widespread expression of a GAD transgene early in the development of NOD mice does not prevent the spontaneous development of GAD autoimmunity (52). An important issue that remains to be resolved is where the rapid spreading of T cell autoimmunity occurs. At 4 wk of age, insulitis is just beginning in unmanipulated NOD mice (50, 53, 54) and is essentially nonexistent in 4-wk-old NOD mice that were neonatally treated with GAD, GAD(524–543), HSPp277, or insulin β-chain in IFA (our unpublished observations). Given the lack of an obvious infiltration of mononuclear cells in the islets of autoantigen/IFA-treated mice, it is tempting to speculate that the precocious autoimmunity develops in peripheral lymphatic tissue (55, 56). The precocious development of widespread Th2-type autoimmunity to β cell autoantigens is likely to significantly exhaust the naive autoantigen-reactive T cell pools. Consequently, fewer naive β cell-reactive T cells will be available for recruitment into the pathogenic response. This exhaustion of naive autoantigen-reactive T cell pools may be a new mechanism, in addition to bystander suppression, underlying the protective effects of Ag-based therapy. The precocious autoimmunity following immunotherapy may not be limited to the Th2 arm, but may also involve other types of regulatory cells. The precocious development of regulatory cell responses to many different β cell Ags, along with the exhaustion of naive β cell-reactive T cell pools, may explain why immunotherapy with many different β cell autoantigens can so effectively inhibit disease when administered early in the NOD mouse disease process. In summary, using a model of a spontaneous model of Th1-mediated autoimmune disease, we examined the effects of Ag-based immunotherapy on the natural autoimmune spreading hierarchy. We observed two unexpected immunological phenomena: 1) immunotherapy caused widespread precocious autoimmunity to downstream target tissue Ags and 2) this precocious autoimmunity occurred even though the mice were healthy (preautoimmune) at the time of treatment and were merely genetically susceptible to spontaneous autoimmunity. These phenomena have not been observed in experimental models of autoimmune disease (such as experimental autoimmune encephalomyelitis) and may be unique to animals that are prone to spontaneous T cell-mediated autoimmune diseases. It is clear from these studies that the immunological impact of autoantigen-based immunotherapy can be far more dynamic than previously suspected. Although our study used IFA to promote anti-inflammatory T cell responses, ongoing human clinical trials with HSPp277, GAD, and insulin are using similar Th2-promoting adjuvants or delivery routes. Our findings underscore the need for caution in the clinical application of Ag-based immunotherapeutics. We thank Drs. Paul Lehmann, Mark Atkinson and Michael Clare-Salzler for comments on this manuscript. ↵1 This work was supported by grants from the National Institutes of Health and the Juvenile Diabetes Foundation International. ↵3 Abbreviations used in this paper: NOD, nonobese diabetic; GAD, glutamic acid decarboxylase; HEL, hen egg lysozyme; HSP, heat shock protein; SFC, spot-forming colonies; T1DM, type 1 diabetes mellitus.